Audi doesn't just make coupes and luxurious sports cars, although those might be the automaker's specialties. No, Audi also has produced a fabulous, compact crossover SUV known as the Q5. The 2017 IIHS top safety pick is back for the 2018 model year and it's here in Wynnewood. Other than the epitome of luxury and class, the Q5 offers top shelf quality in terms of performance, safety, and technology, which we will explore below. One quick glance at the Audi Q5 should pique your interest. Its beautifully crafted design stands out from the pack. The signature Audi grille will leave car enthusiasts salivating and the narrow, sleek headlights have a style all to their own. The 2018 model has been redesigned and refined so that maximum luxury and comfort can be met. Let's dive into some more details. We know you want to drive this great-looking SUV. Take a look and get a feel for all of its amenities for yourself. The Audi virtual cockpit utilizes a high-def display screen placed between the vehicle's meters. This instrument cluster uses Google Earth and Good Street View as screen options for navigation so your driving experience will feel as futuristic and immersive as possible. Other key features include Audi pre sense, which helps to keep occupants safe if an oncoming collision is sensed. We hope it is never used, but Audi pre sense can prepare the Q5 for impact by automatically closing windows, pre-tensioning seat belts, and preparing the brake system. Head-up display is a modern innovation that projects important information onto the inside of your front windshield so your eyes don't have to leave the road. 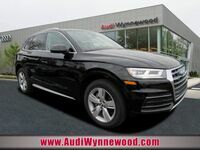 Come on down to Wynnewood Audi and check out the Q5. All of the words and pictures in the world don't do it justice. Come on by to test drive it or just take a stroll in our showroom. Whatever you decide, we'll help you along the way. We hope to see you soon!